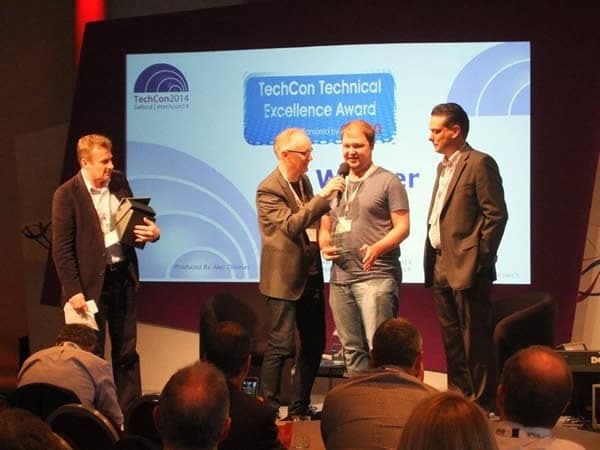 RCS and the Absolute Radio group has been awarded the 2014 TechCon Technical Excellence award at the UK Radio Festival in Manchester, England. The award, sponsored by Arqiva, recognizes the world’s first fully-synchronized split music service whereby the presenter is heard live across multiple different format radio stations, but the music is separate and relevant to each genre in every case. Since 2008, the breakfast show on the seven Absolute group radio stations has been common (the award-winning Christian O’Connell Breakfast Show) and, until earlier this year, so was the music. However, after the breakfast show was over, each service resumed its musical format: Absolute Radio 60s, 70s, 80s, 90s, 00s, Classic Rock or the main radio station. What Absolute wanted to achieve was the avoidance of format confusion, so while they still wanted Christian O’Connell to be the breakfast presenter for all services, they wanted to music to be format-specific. Working closely with the Absolute Radio project team, RCS UK’s Chris Voce, RCS developed a clever utility that takes the schedule of the main station and requests matching songs of the other six services, taking all GSelector rules and of course the length into account. The end result is a service where the music played on Absolute Radio’s Christian O’Connell Breakfast Show is different depending on whether listeners are tuned into Absolute Radio 60s, 70s, 80s, 90s, 00s, Classic Rock or its main station – but the live Christian O’Connell bits in between the music are the same on all services. Jon Earley (RCS) and Robbie Harrison (Absolute) being given the award. At the 2014 Australian Commercial Radio Awards, Nova Entertainment won the Award for Excellence in Engineering for the installation of Zetta across the Group. The Nova team lead by CTO Mark Downes were instrumental in executing a professional project plan and management of the rollout and matched with RCS’ Chris Bean as our Project Manager it was a success. All this effort was preceded by installing and training GSelector throughout the group too and was part of the project. Mike Cass Assistant Group PD accepted the award in Melbourne here. 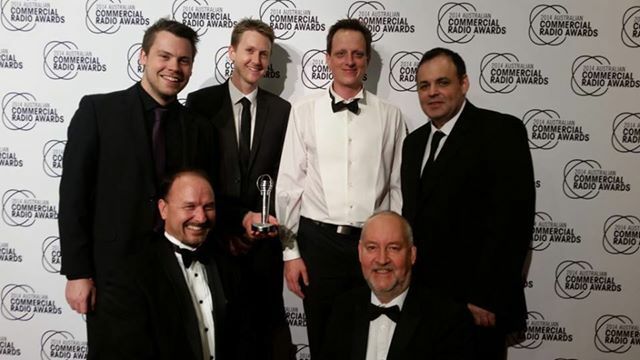 Mike Dean (top left) with the Nova Entertainment Zetta Project Team after winning ‘Excellence in Engineering’ for the Zetta installation at the 2014 Commercial Radio Awards in Melbourne on Saturday night. Copyright © 2019 RCS. All Rights Reserved. All marks and logos are trademarks or registered trademarks of RCS. Other trademarks are the property of their respective owners.